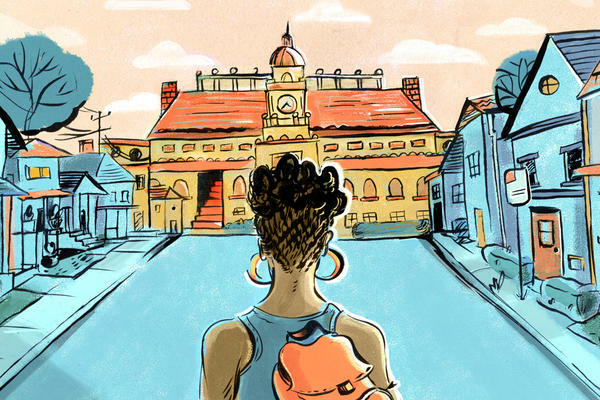 And, it's not that these students just aren't there — every year tens of thousands of top students who don't come from wealthy families never even apply to elite colleges. Universities are taking note — and banding together under something called the American Talent Initiative — a network backed by Bloomberg Philanthropies, the Aspen Institute and the research firm Ithaka S+R. To join the club, schools have to graduate 70 percent of their students in six years — a qualification that leaves just under 300 schools in the U.S. eligible. About a third of those schools — exactly 100 — have signed on. Their goal? Enroll 50,000 additional low- and moderate-income students by 2025. Each school has its own goals, too — many want to increase the number of Pell Grant students on campus, others aim to improve graduation rates — but they're all on board to share strategies, learn from each other's missteps and provide data to monitor their progress. I spoke with four university leaders about this initiative: Michael Drake, the president at The Ohio State University; Biddy Martin, president of Amherst College in Massachusetts; Mark Schlissel, the president of the University of Michigan; and Rebecca Blank, chancellor of the University of Wisconsin-Madison. Our conversations have been edited for length and clarity. What's the impetus for you to be a part of this? Blank: This is really important. We need to make sure that we are accessible to all students. The symbolism of that is as important as the actuality of what we are doing. Schlissel: We [Michigan] are a public university. And to me, that means we have to serve and capture the talent from the full breadth of the public. To be honest, we've done a poor job of identifying and recruiting students from the lower half of the income spectrum in my home state of Michigan. Only 10 or 15 percent of our in-state students are from the lower 50 percent of the economic spectrum. I'm 100 percent convinced that talent is distributed uniformly across society. There's no data to suggest that if you happen to be born into a less well-to-do family you are somehow less intelligent. The challenge for us is to recruit them and make it financially viable for them. Drake: The students exist. The pool is ready for us. And as I talked with presidents and chancellors of other schools, I actually found we had research and energy from colleagues to do something about it. Why is it necessary to do this together, across the higher education system? Martin: The size and scale of an Amherst can be an advantage. But, obviously, Amherst and other liberal arts colleges can't do this alone. Our great flagship campuses graduate by far the great majority of students with college degrees in this country and also do the majority of the research that has been an engine of growth and well-being for the country for so long. Schlissel: We can all hear one another's ideas and the different challenges we're trying to meet. And although we're different types of institutions, we share the best practices. I've presented what we've done, and a lot of other schools are excited about it. Drake: We'll learn the most effective things and the most impactful things on an ongoing basis from each other. So this is an initiative where people come together and share their best practices with the hope that the rest of the members of the initiative will be able to copy and make good use of them. Blank: It's always more fun to work with a whole club of other schools. Are there other schools you've been watching? Things you've seen that you want to adapt for your schools? Martin: We're looking at what Princeton is doing in their summer bridge programs for students from low-income backgrounds and first-generation students. Last year I visited the University of Maryland, Baltimore County. I like the idea of borrowing from all kinds of institutions. Schlissel: One thing Princeton is doing is they're starting to take transfer students. So that's something they hadn't done before. Drake: I heard from the University of Michigan that they follow up on their outreach to students from low-income communities and high schools. In addition to letters and emails, they were following up with phone calls and invitations and other secondary levels of recruitment that seemed to be very effective; more effective than just sending a letter. The University of Washington is focusing on their students who began at a different campus. They are featuring speakers who transfer to their school and we're planning to do that this year at Ohio State. As enrollment shifts and changes, do institutions have to change their culture, and how they go about doing things on campus? Martin: I think the institutions have to let themselves be changed by the student bodies we have. There's also a whole set of ways — including curriculum pedagogy and cultural dimensions of the place — that change as the student body changes and that is a really wonderful and fascinating process to watch and to have some responsibility for ensuring that goes well. Schlissel: We need to use our current students as a focus group and ask them, you know, what was on their minds as they were looking at their futures and how did they decide or to think about college or work. We do this in an unorganized way. So for example even as the president of a big organization I have office hours for students to sign up to come and see me. One way schools in the initiative are attracting low-income students is to offer free tuition to students with families that make under a certain threshold. For Michigan, it's $65,000, for University of Wisconsin-Madison it's $56,000. Blank: It's a message to low-income families who are hearing, "College is expensive. You don't want to take out loans. It's terrible." Often if you're a first-generation student, no one's gone to college. You're thinking it's just not for you. We want to get the message out: If you are able to get into UW-Madison, we will work with you to make sure you can afford it. It's really about making it clear that we're affordable to low-income and moderate-income students. Schlissel: Half the families in my state are below that level. And to me, attracting students from that part of the socioeconomic spectrum is part of diversity on campus. The hard part is convincing a person that they could actually afford to go to a highly selective college like the University of Michigan. This is the branding of our financial aid. Instead of saying "need-based," we say "free tuition." I'm happy to do that. Drake: It's really making sure that talented young people understand that there are opportunities available for them. So our initiative to offer free tuition to Pell Grant students is meant to both be simple for people to understand, and that by covering the cost of tuition we decrease the cost of going to college. And so these students can leave with less debt. Even after students enroll, there's often huge wealth disparity on campus. Schlissel: Students arrive on campuses with all different levels of wealth. Some kids get to take ski trips on three-day weekends and can fly out to Colorado with their family. And other students, you know, don't really even have a home to go back to. And that's a broad spectrum and yet they're all being educated side-by-side. So you can imagine the social model, when you're confronted with peers with tremendously different capacities, is challenging. So that's another thing we have to work to support. Martin: I've spent a lot of time thinking about how to identify what I call opportunity gaps that arise and become apparent once you have a student body from such a wide range of backgrounds. Maybe one of the most obvious, but also significant, would be internships. But it's also the case when it comes to travel, or when it comes to anything additional that students and faculty decide would be advantageous. We have to make sure that it's possible for all of our students to take part. So does it all come back to money? Martin: I mean, there's no question that Amherst is able to do what we have done and continue to do because of our endowment. For schools with smaller endowments, it's harder. Different choices have to be made. You're going to sacrifice other things in order to put resources toward this effort. It's always a matter of trade-offs — like making need-based aid a higher priority. Schlissel: It's also about support. A community that doesn't often send their kids to selective colleges, these students need some transition support. They need closer mentoring and advising. They need some community building activities. They need to find a sense of place. And after a year or so, they do as well as any other student admitted to Michigan. But they just need some transition support. Drake: Retention is a big part of this. We have early outreach advising, particularly when students show signs early on of tripping up in ways that we know are likely to predict the lack of success later on. We don't wait until a student gets a bad grade in a class or drops a class before we intervene. Friends from Georgia State found many students who were seniors were very close to graduation but couldn't register because of a financial hold on their records. It might be something small; a few hundred dollars for instance. So they gave completion grants [that were] available to students who in the past maybe would have had to drop out to work for a while, getting some money and then re-enrolling. We've done the same and have significantly increased our number of these completion grants in the last year.